University of Notre Dame alumnus, Robert Hall, Southland College Prep Board’s attorney, leads the school’s junior class on a tour of his alma mater. For members of Southland College Prep Charter High School’s junior class the charter bus ride to South Bend, Indiana wasn’t your typical high school field trip. 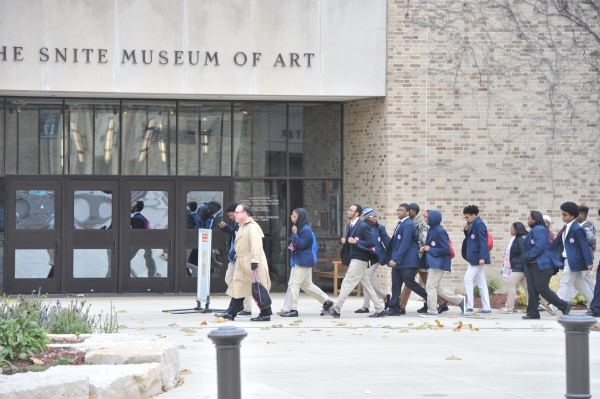 “Annually, our entire junior class has the opportunity to tour the University of Notre Dame, for we want our students to have a first-hand understanding of what it means to enroll and to study in one of America’s top educational institutions,” explained Dr. Blondean Davis, Southland’s CEO. During this fall’s tour, led by Notre Dame alumni, Robert Hall, Southland College Prep Board’s legal counsel and college counselor Robert Lane, the junior class walked the campus and visited some of the university’s most iconic sites. They toured the Notre Dame Stadium and had the privilege of tagging the “play like a champion today” sign as they stepped onto the 87-year-old historic football field. A highlight of the campus tour was a session in the school’s historic golden domed Administration Building where the Southland juniors learned from university representatives about the history, culture and day-to-day life at the University of Notre Dame. During a brisk tour of the university campus, they saw its library, art and science buildings as well as the grotto where students of all faiths stop and visit. Southland’s junior class also met two alumni of their own school who are now third- year students at the University of Notre Dame–Chaz Milligan, who is studying in the Mendoza School of Business and Dennis Small, who is pursuing a degree in industrial design. “This experience at Notre Dame is just one of several ways Southland College Prep undertakes to prepare our graduates for enrollment in some of the top colleges and universities in the U.S.,” said Ron Anderson, Southland’s senior college counselor. Every member of Southland’s senior class graduates and all are admitted to college with merit-based scholarships, he added. “So, annually, representatives of many prominent colleges and universities request to visit Southland College Prep. This fall, we’ve hosted representatives from such schools as: Cornell, Marquette, Northwestern, Ohio State, University of Illinois Champaign and Chicago, University of Michigan, University of Missouri, University of Pennsylvania, University of Virginia, Vanderbilt, Washington and Lee, Yale, and many others,” he explained. “The president of Illinois State University, where several alumni are enrolled, addressed our junior and senior classes earlier this fall. “Historic Black Colleges and Universities like Morehouse College and Fisk University as well as liberal arts institutions such as Carleton, Knox, and Coe spent time with Southland College Prep seniors this year,” Anderson said. To make these sessions as productive as possible, we take care to match up individual Southland students with representatives of prospective institutions where we believe they will do well, Anderson added. Southland College Prep Charter High School, housed in a repurposed former insurance company’s call center building, opened in August of 2010. It is the only public charter secondary school to serve Chicago suburbs. Southland’s enrollment is capped at 530 students by the Illinois State Charter School Commission. Admission to Southland is on a non-discriminatory basis with respect to race, ethnicity, disability and religious preference. Enrollment is non-selective and students enter a well-publicized annual public Lottery to earn one of the 530 seats at Southland. The only criteria for admission are successful completion of elementary school and residence in District 227’s four elementary school districts. Southland College Prep Charter High School is focused on preparing all of its graduates to enter and to earn a bachelor’s degree from a four-year college or university. Southland College Prep operates on a European-Asian school model nine-hour school day from 8 a.m. to 5 p.m. five days a week. The college prep curriculum is rigorous with a strong emphasis on math, science, technology, language and fine arts. After school extra-curricular activities include sports, speech and forensics, band, chorus, dance and service projects. Students earn 30 credit hours; eight more than are typically required of traditional high school graduates. Demographic information regarding Southland’s students is reflective of the communities in which the students live. Currently, 95% of Southland’s students are African American, 1% is Hispanic, less than 1% is Asian, 1% is White, and 2% are identified as “Other.” Sixty percent of Southland’s students are economically disadvantaged as measured by the federal school lunch program. Some 9.5% of Southland’s students receive special education services. Southland is achieving its goals of ensuring that 100 percent of Southland’s graduates will be admitted to colleges and universities of their choice and that they will have the financial resources to make college attendance a reality. Southland’s graduates have been accepted by top colleges and universities in the U.S., including seven of the eight Ivy League schools and 38 of the top 50 schools ranked by U.S. News & World Report. In a recent comparative study by the Illinois Network of Charter Schools, Southland College Prep ranked number one for ACT performance, attendance and graduation rate among all Illinois non-selective enrollment high schools with a 75% or greater African-American student enrollment and a 50% or greater rate of students qualifying for free/reduced lunch. The first four Southland College Prep graduating classes of 2014-17 were offered more than $75 million in merit scholarships to many top U.S. colleges and universities where they are now enrolled.